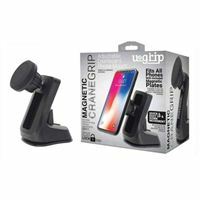 Aduro magnetic crane grip phone mount fits all smartphones, just attach the included magnetic plate to back of phone to attach phone to mount. Quick and easy up and down movement to fit your viewing angle. Secure suction lock, to keep mount secure on vehicle dashboard.